She was appointed Lady Companion, Order of the Garter (L.G.) in 1378.2 From 24 June 1380, her married name became Hastings. 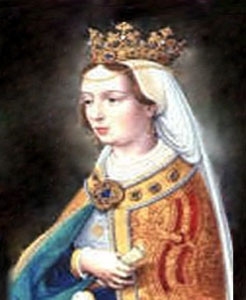 Her marriage to John de Hastings, 3rd Earl of Pembroke was annulled after 24 September 1383.2 From 24 June 1386, her married name became de Holand. In 1399 she having allegedly lost her heart to her third husband when he triumphed at a tournament.4 From before 12 December 1400, her married name became Cornwall. 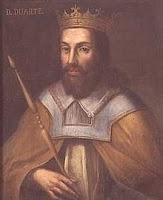 João I de Aviz, Rei de Portugal was born on 11 April 1357. He was the son of Pedro I de Bourgogne, Rei de Portugal and Theresa Lourenço Martins.3 He married Philippa of Lancaster, daughter of John of Gaunt, Duke of Lancaster and Blanche of Lancaster, Countess of Derby, on 11 February 1387 at Oporto Cathedral, Oporto, PortugalG.1 He died on 14 August 1433 at age 76 at Lisbon, PortugalG. He succeeded as the Rei João I de Portugal in 1385.3 He gained the title of Grand Master of Aviz.3 João I de Aviz, Rei de Portugal also went by the nick-name of Joâo 'the Great'. [S6] G.E. Cokayne; with Vicary Gibbs, H.A. Doubleday, Geoffrey H. White, Duncan Warrand and Lord Howard de Walden, editors, The Complete Peerage of England, Scotland, Ireland, Great Britain and the United Kingdom, Extant, Extinct or Dormant, new ed., 13 volumes in 14 (1910-1959; reprint in 6 volumes, Gloucester, U.K.: Alan Sutton Publishing, 2000), volume I, page 246. Hereinafter cited as The Complete Peerage. She was also known as Alice Halys. [S11] Alison Weir, Britain's Royal Families, page 60. Arthur Plantagenet, Earl of Richmond was born on 29 March 1187 at Nantes, Bretagne, FranceG.2 He was the son of Geoffrey II Plantagenet, Earl of Richmond and Constance de Bretagne, Duchesse de Bretagne. He died on 3 April 1203 at age 16 at Rouen, Caux, FranceG, possibly murdered by King John.2 He was buried at Notre Dames des Prés, Rouen, Caux, FranceG.2 He was buried at Bec AbbeyG. [S18] Matthew H.C.G., editor, Dictionary of National Biography on CD-ROM (Oxford, U.K.: Oxford University Press, 1995), reference "Arthur, 1187-1203". Hereinafter cited as Dictionary of National Biography. [S11] Alison Weir, Britain's Royal Families, page 64.